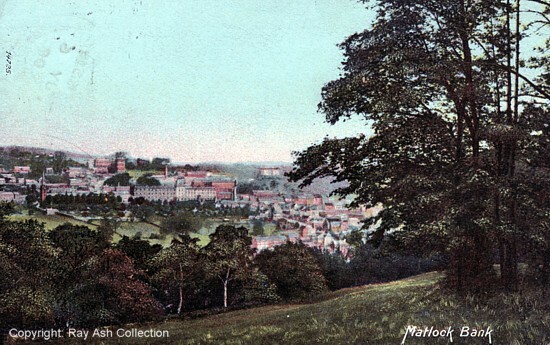 There were still a large number of fields on Matlock Bank in 1908. This picture was taken from Snitterton Road on the Masson hillside. The view is difficult to replicate the view today because trees are in the way but it could have been taken from roughly where Limestone Croft is today or from closer to the White House. It includes Smedley's Hydro, which is the long grey building with the central tower slightly left of centre, and several other hydropathic establishments. Matlock House is just to the right of the chimney above Smedley's and Rockside is slightly higher up. Chatsworth Hydro is probably the building on the horizon, close to the trees. The card probably dates from a couple of years before it was posted as the major extensions at Rockside were complete but the spire had not been added to the Methodist and United Reformed Church on Bank Road. In the message on the back the unnamed sender compared Matlock with Malvern (known today as Great Malvern) in Worcestershire. Postcard The Wrench Series No: 14725. 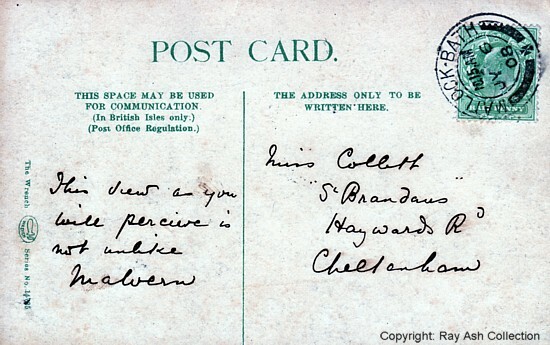 Posted 6 July 1908 in Matlock Bath and sent to Miss Collett in Cheltenham. Another card was also posted in 1908.